Why the Focus on Real Growth Rates? We asserted without justification that our goal was to forecast quarter over quarter real growth rates (adjusted to annual rates which is just a unit change). At this point, we turn to the question as to whether this is the most appropriate object or whether other definitions might be preferred. Why concentrate on growth? There is a lengthy literature on the merits of growth and that countries that fail to grow are doomed. Real growth at a rate higher than population growth usually indicates a rise in the standard of living for the countries’ citizens (exceptions of course if rulers appropriate added income). The argument of growth being important is usually taken as a given and a great deal of government planning revolves around forecasting growth to understand potential tax revenues against planned expenditures. Productivity growth is usually meant to be labour productivity. Can we produce more goods and services (real GDP) with the same or possibly less labour inputs? Some people see unbounded growth as naïve suggest that there are limits to growth. In my opinion, this confuses the physical limitations (say land) that may eventually dictates that growth will cease with the near term we all live in. And although these are great philosophical questions and worthy of debate, it is far from my competitive (or absolute) advantage to do this. So let me move back to solid ground. With a natural interest in real growth, it is not surprising that economists have sought to model growth both theoretically and empirically. The results of this modelling have been mixed and many questions remain outstanding. Growth and growing income inequality spring to mind. While these academic debates spin along, the demand for forecasting real growth is unabated. The parallel to polling comes to mind. Everyone criticizes polls (especially me) but they are read, argued about and used by a number of folks. Forecasters are in the same boat! Like our earlier work, most forecasters use quarter over quarter real growth. Producing a four quarter ahead forecast produces the next year’s outlook. Most forecasters also report a year over year growth rate forecast as well. For example, at the time of writing, the 2015Q3 was not yet released and it is common to see forecasts for the end of 2015Q4, the yearly forecast for 2015 and a 2016 forecast. Given the persistence observed in the quarterly data, one might indeed question the methodology used in these longer horizon forecasts. Occasionally these were updated so that more current information was used. But still 2017 is quite a ways off and are we simply just forecasting the average growth rates observed over the decade? No current information is actually tempering the 2017 annual forecast! Quarterly real growth for Canada is a rather herky-jerky series (another way of saying that there is little persistence) which makes discussing trends in growth rates largely meaningless. If we just want to forecast what is demanded by policymakers, then we can leave this issue aside. But we think there is some value in pursuing the measurement question further and we shall briefly look at other possibilities. Changes in stock prices are also not persistent (if they were we could do the forecasts and be rich). Analysts have tried to extract “direction” from recent price movements by smoothing or averaging. Popular calculations are 50/200 day moving-averages. These slower moving objects create trends that can be analysed for breaks, cross-overs and other features used in technical analysis. Similarly new uptake in jobless claims, monthly employment changes and other higher frequency data have measurement error, noise etc. and it is common to smooth them by averaging over some interval. This smoothing is viewed as extracting the “signal” from the noise and thus is helpful in interpreting current activity. Real growth may be a candidate for such smoothing and we explore this. Since forecasting is driven by demand and the demand is for quarterly real growth forecasts, we are not offering this as a substitute. Call it academic curiosity! evidence of cycles with longer lasting peaks and troughs (albeit reduced in magnitude). While there is much to recommend to studying smoothed growth rates, they are not the ones widely implemented in academic real business cycles papers. They are also never forecasted. Many trending series exhibit prolonged departures from the trend line. Such deviations from trend line can indicate upturns/downturns. We often see series graphed against trend lines in the press. In the United States there was a rather strange debate as to whether US real output was better characterized as I(1) (growth) or I(0) (trend stationary) with a break at the Great Depression (1929). Although this particular question is not of great empirical interest in itself, the idea that real output might be trend stationary cast some questions on the focus on growth rates. Below we graph real GDP, its trend and deviations from growth (scale is on right). The 1980s are characterized by above trend growth, the 1990s below trend growth and the 2000s until crash of 2009 at trend. Recent data places us below trend. Roughly speaking this categorization accords with our perceptions of the level of economic activity over the last 30 plus years. But the deviations are I(1) and therefore not stationary. The autocorrelation function (ACF) dies down very slowly with a first-order coefficient of 0.96. This makes deviations from trend not suitable for most empirical forecasting or theoretical analysis. And that leads us to the most popular measure used by real business cycle researchers. The spikey behaviour in real growth rates is a common feature across most developed countries. It is not consistent with business cycle movements that we think are slow moving phenomena. The debate on what became the standard measure is mostly unsatisfying and I will spare you the gory details (for the real old folks in the crowd, see Cambridge controversy on measuring physical capital). Real business cycle models seek to understand the ups and downs in the economy that we know exist but find difficult to measure. Good times and bad times typically arrive with some warning or in the language we have used, they have persistence. The theoretical models typically have real output and other real magnitudes changing slowly depending on the nature of the shocks. The Hodrick-Prescott filtered data is a much slower moving series than real growth rates (a first order autocorrelation of 0.9 vs. 0.5) but is nevertheless stationary. Since no professional forecaster ever predicts HP filtered data we will leave this concept and this debate. Happy New Year to my Readers (I imagine there is someone out there). On this first business day of 2016 and where the market kind of tanked worldwide, I thought I should bring in the latest forecasts for 2015Q4. They are not very hopeful but those folks who do longer run forecasts tell us 2016 will be better. We will see. This graph is reproduced in my header but is also below. 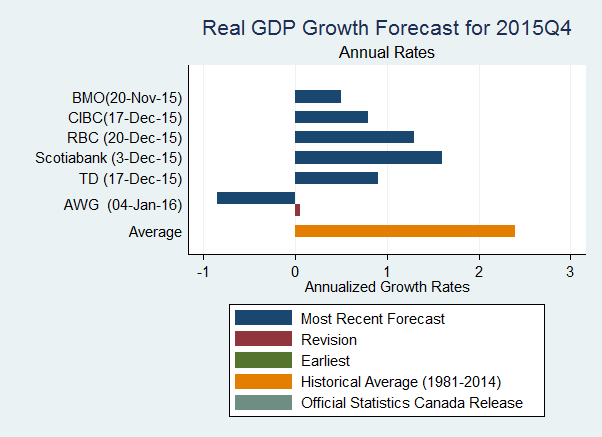 My own Canadian real GDP growth forecast at this point is -0.85%. The high is Scotiabank with a slim 1.6% growth (all annual rates). The rest fit in between. In the coming weeks I will let you folks know the current model I am using (involves incorporating monthly real GDP as they become available). 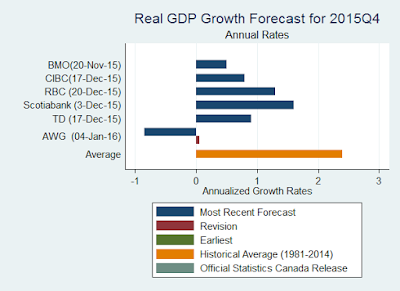 How Much Better are we Doing with Autoregressive Models to Forecast Real GDP Growth?